If you've ever gazed with wonder at the Statue of Liberty, studied the iron latticework of the Eiffel Tower, or thought How on earth did they do that? while staring at Mt. Rushmore, you are, in fact, a consumer of public art. Public art can inspire, engage, and evoke smiles, jaw drops, even tears. 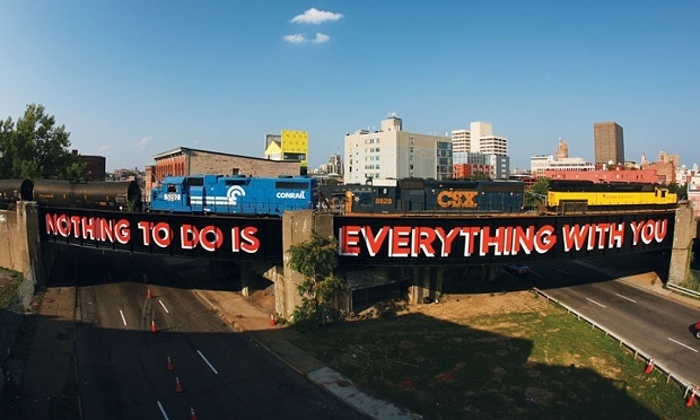 "Some communities see public art as a way of enhancing or personalizing otherwise impersonal spaces. Others view it as a means to activate civic dialogue or provide a vehicle for the community to express its identity," wrote founder and executive director of Forecast Public Art Jack Becker in the Monograph, a journal for the Americans for the Arts, the nation's leading nonprofit organization for advancing the arts and arts education. Art is fundamentally subjective and the intention and meaning behind public installations are manifold, owing both to contextual variability and artists' individual motivations. Whether it's a once-insecure kid who, now as an adult, is reminding Chicagoans that they are beautiful or guerrilla knitters draping Los Angeles street signs with colorful yarn, this mode of communal expression has a consistent power to remind us of our collective humanity and elevate the values of neighborhood and social good. There is so much art waiting to capture your attention and warm your heart right outside your door. To name a few, here are 5 of our favorite public art projects that are transforming where we live and, most importantly, how we see the world. It's a lot brighter than most of us imagined. To see ten more, visit Sonima.com. 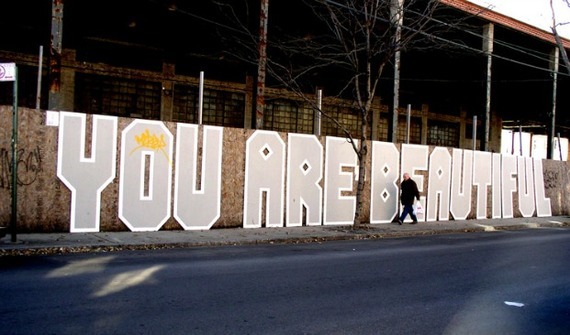 Inspiring message: Whether it's printed on an 80-foot sidewalk barrier in Brooklyn (pictured below), massive billboard in Buffalo, or Rice Mill Lofts building in New Orleans, the message is loud and clear: "You Are Beautiful." The intent is simpler: To help people remember how special they are, inside and out. The idea for this uplifting art project came to Matthew Hoffman 10 years ago when he moved to Chicago after graduating college with a degree in graphic design. "Growing up, I moved around a lot, and I had self-esteem issues from always being the new kid, trying to figure out how to navigate life and make friends. As an adult...the feelings were the same. I wanted to create something that told people, 'You're OK just as you are,'" he says. He started with small rectangular "You Are Beautiful" stickers that people were encouraged to slap on street signs, lampposts, in library books and more. It blossomed into artwork from there. "I've always enjoyed creating a conversation with the public," Hoffman adds. "I like to put an idea out there, and let the viewer take it however they need to in that moment." Inspiring message: Taiwanese-American artist Candy Chang is curious about your bucket list. 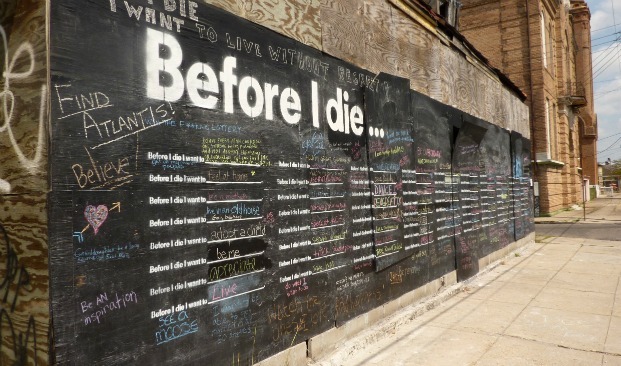 So in 2011 she put together a stencil that read, "Before I die, I want to _____" and using chalkboard paint, spray-painted it multiple times on the side of an abandoned house in her New Orleans neighborhood. She then left some chalk at the location and waited. In less than 24 hours, "it was covered in chalk dreams as neighbors stopped and reflected on their lives," Chang writes on her website. As of today, more than 1,000 Before I Die walls have been erected in more than 70 countries, including Kazakhstan, Iraq, Haiti, China, Ukraine, Portugal, Japan, Denmark, Argentina, and South Africa, most in their native languages. NBC's Brian Williams described it on his "Rock Center" TV show as "the stuff of everyday life from people of all walks of life." He adds, "Young or old, rich or poor, the 'Before I Die' wall does make you think as you walk by." 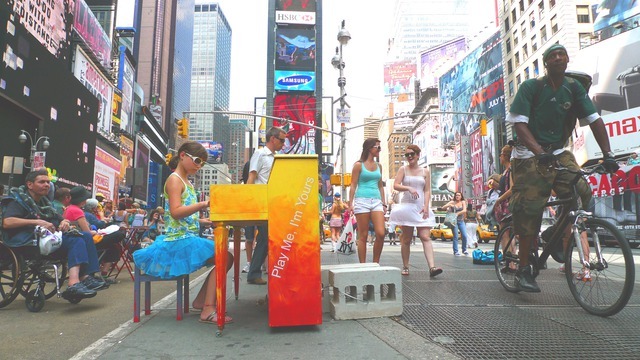 Inspiring message: The cool concept first came to British artist Luke Jerram about seven years ago while sitting in his local laundromat as he explains on StreetPianos.com: "I saw the same people there each weekend and yet no one talked to one another. I suddenly realized that within a city, there must be hundreds of these invisible communities, regularly spending time with one another in silence. Placing a piano into the space was my solution to this problem, acting as a catalyst for conversation and changing the dynamics of a space." To date, more than 1,400 pianos have seemingly magically appeared in parks, markets, bus stations, and even on ferries in 47 cities worldwide. Every piano includes one message "Play Me, I'm Yours," inviting anyone and everyone to tickle the ivories. Jerram likens this interactive social experiment to "a musical equivalent of Facebook designed to provoke people into engaging, activating, and claiming ownership of their urban landscape." Inspiring message: A string of 50 romantic rooftop murals spanning about 20 blocks along Philadelphia's Market Street corridor "collectively express[es] a love letter from a guy to a girl, from an artist to his hometown, and from local residents to their neighborhood," according to Philadelphia's Mural Arts Program's website. The year-long project that was commissioned in the summer of 2009 required 1,200 cans of spray paint, 800 gallons of bucket paint, and 20 of the country's best spray-painters to help make Steve Powers' vision, A Love Letter for You, come to life. The Philadelphia-native, who is a graffiti artist and Fulbright scholar, sees the project as his "chance to put something on these rooftops that people would care about." Inspiring message: Since 2005, Kamelia Hristeva's Green Star Movement has brought mural arts programming to more than 5,000 mostly at-risk students. Together, they have turned gray concrete slabs, abandoned parks and deserted underpasses into glistening mirrored, colorfully grouted, ceramic-tiled urban canvases. 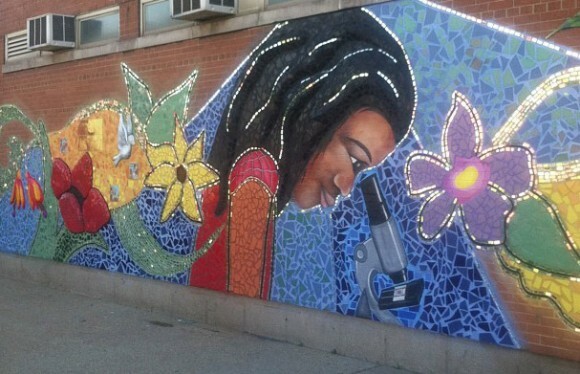 The nonprofit partners with schools and neighborhoods to create urban public art projects throughout Chicago and abroad using a technique called bricolage, an intricate 3-D combination of mosaic, sculpture, painting, and photos that is accessible for artists of all ages and abilities as well as incredibly durable and resistant to vandalization. Click here to see more beautiful and inspiring projects like this on Sonima.com.